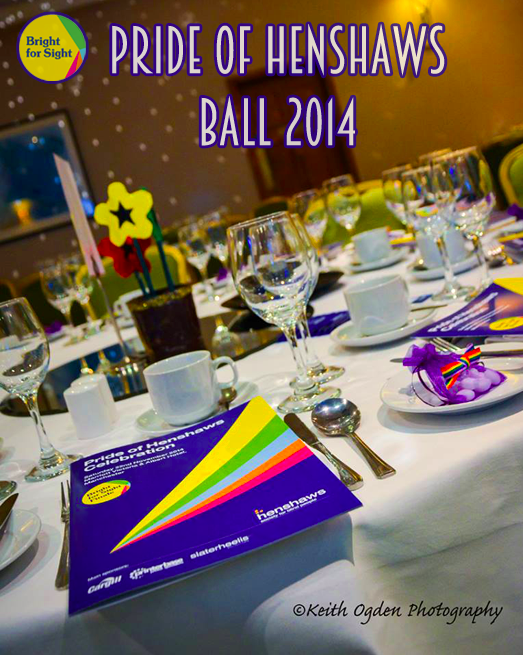 This year's Pride of Henshaws Ball took place on Saturday, 22nd November at The Marriott Victoria & Albert Hotel in Manchester. This is the second Ball to date, returning after last year's success, celebrating the achievements and hard work of the inspirational service users and volunteers of Henshaws Society for Blind People. The event was the finale to the Bright for Sight campaign, helping to raise awareness and much-needed funds for Henshaws, to support people living with sight loss and other disabilities. Mark Edwardson, TV news presenter and journalist for BBC North West Tonight, hosted the Ball which included speeches from Nick Marr, Chief Executive at Henshaws, and Andrew Rose, Trustee Board member, as well as a raffle, auction, disco and three-course meal. The award categories were expanded this year with 4 awards in total; the Technical Star Award, the No Fear Award, the Volunteer of the Year Award and the Gillian Lawrence Award - the main award of the evening named after a long-standing Chairman and Trustee of Henshaws, who sadly passed away in 2012. 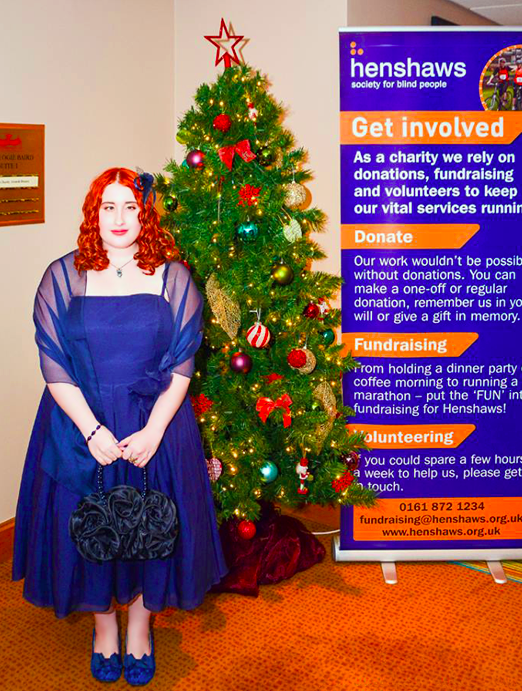 I was notified previous to the event that I had been nominated in some of the categories, and was told in the week running up to the Ball that I was a finalist, but couldn't be told which category for and whether I was a winner until the night of the event. I never imagined that the category would, in fact, be the Gillian Lawrence Award! Bewildered and suddenly nervous, I was gobsmacked to learn that I was in the event programme and that myself and another service user had made it so far. 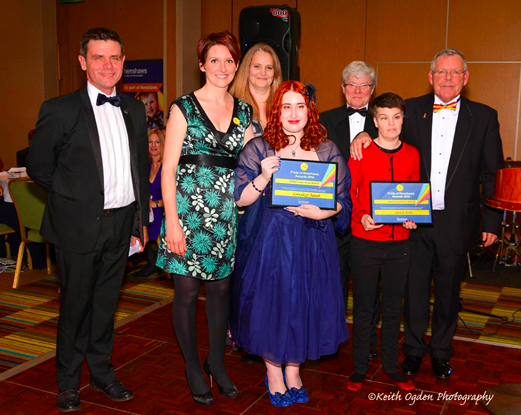 Just to be told that I was a nominee, and then a finalist, was achievement enough for me - but to have my name called out when the awards were presented was just incredible! 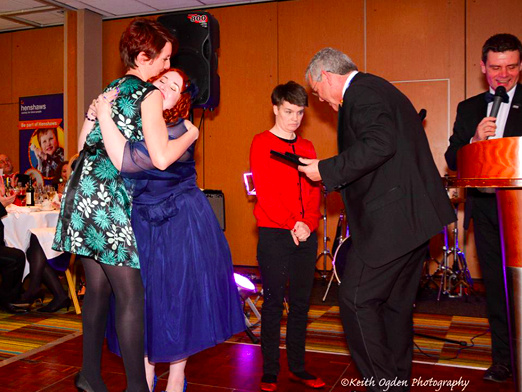 I immediately felt the tears coming as it was just such an overwhelmingly emotional moment to be presented the award by Gillian's daughter, Sarah, and to have everyone clapping and cheering for me. I couldn't stop hugging everyone who congratulated me! It truly was, and still is, an immense honour to have won the award for overcoming all of my personal obstacles and for being a positive role model. It has been an amazing journey over the past year and a half since I first discovered Henshaws at the Manchester Eye Hospital and started the Living With Sight Loss course in June 2013. From being so insecure and self-depricating to now being hugely confident, optimistic and more independent than ever, it has been a transformation that has surpassed all of my expectations! I have undertaken Braille, Arts & Crafts, Relaxation and Employability courses, learned kitchen and mobility skills over a 9 month period with re-ablement officers, have given speeches and been involved with some fantastic fundraising events and, since the start of September, now have a work placement with the fundraising and marketing team; helping to promote the life-changing work that Henshaws does for so many other people like me. I have been through the whole cycle of the Pathway to Independence and wish I could put into words how grateful I am to the staff, volunteers and fellow service users of Henshaws for their continued support! The Steering Group and I held a teleconference last night to discuss our recently drafted charter. We looked over each of the 7 points, as a group, making clarifications and expanding points to provide more detail of our asks. The amended charter will be e-mailed around to the steering group, followed by the wider network as a whole, in the very near future. After editing the charter we moved our conversation towards how we would present it to the industry. Do we target individuals or do we look into communicating with head offices in the retail sector? We agreed that the New Year would be a good time in order to do this, with 'New Year Resolutions' being a suitable theme of which to achieve our asks, and perhaps even launch an event nationally to draw attention to the charter itself and the evidence we've explored. We talked about the bus charter and how that was recently presented with a nationwide event; first with a meeting at the Head Office, proceeded by the Minister of Transport giving a speech, with bus companies following suit and signing up to the charter. Finally, we conversed about what to do at a local level. Coffee mornings and group meetings at coffee shops, involving visually impaired people for their support, were mentioned as well as contacting local store managers and staff members. This is something we will be thinking about over the next few weeks. The next steering group teleconference will be held in the evening of Tuesday, December 9th. 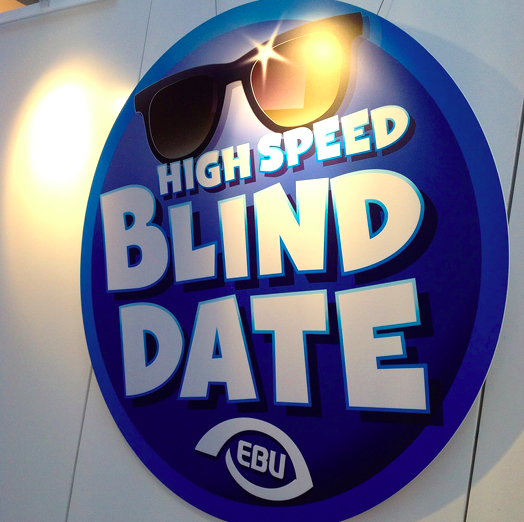 Last week I travelled to European Parliament in Brussels, Belgium, to represent the RNIB in a two-day 'High Speed Blind Date' event held by the European Blind Union. The event ran on November 11th and 12th and was designed to reach out to MEPs, researchers and journalists through interactive activities to showcase the increasing inaccessibility barriers faced when using manufactured goods, information, services, websites and apps. There are 30 million blind and partially sighted people living in Europe and manufactured products, such as kitchen appliances, are continuously becoming harder to use independently. The older, more tactile products contain control panels that feature physical buttons and dials but these are slowly being replaced by touch screens and LED screens. ATMs, ticket machines, television menus, shopping and banking are already headed in the same direction of digitalisation. 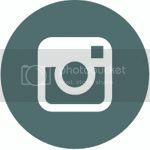 Without audio features or accessible apps to use in conjunction with these products it is becoming impossible for the visually impaired to use everyday items without relying on the help of sighted friends and family. The Blind Date event consisted of shifts of blind and visually impaired people based at individual tables which housed different examples of manufactured goods, both old and new to show the contrast in the ease of access between the two, for the blindfolded 'dates' to attempt to use! Items ranged from remote controls, to washing machine control panels, to an imitation iPad emblazoned with a CAPTCHA image on the screen. 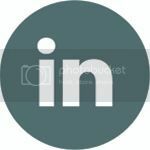 CAPTCHAs are verification codes that often appear when shopping or banking online and a huge barrier for visually impaired people when such visual generated responses are not accessible with an audio feature or when the website itself is not compatible with screen readers. 100% of the blind dates I talked with (including MEPs, researchers and journalists based all over Europe) found the older model of washing machine control panel much easier to use with its tangible buttons; and admitted that they wouldn't be able to do their washing independently if faced with an LED screen or a touch screen, with their blindfold still firmly in place. The majority also confessed to finding it extremely difficult when attempting to read the CAPTCHA code, provided on the imitation iPad, whilst wearing the simulation spectacles. With this foundation of evidence, it is clear that we urgently need the EU to deliver a strong European Accessibility Act to regulate products and services, as well as a robust Directive on the accessibility of websites and apps. With strong political support we can achieve this change. I also had the opportunity to have personal meetings with local MEPs (Theresa Griffin, Julie Ward and Jacqueline Foster) to discuss more localised issues that I face in my home area of Salford and Greater Manchester. The discussion was mostly focused around transport, especially buses and trams, in the Greater Manchester area. TfGM have recently installed scanners on Metrolink station platforms for Concessionary Pass and Concessionary Plus Pass holders to scan their passes. Not only is it difficult for a blind pass holder to actually find the scanner itself on the platform, it is also an obstacle to make sure the pass is facing the correct way against the screen. 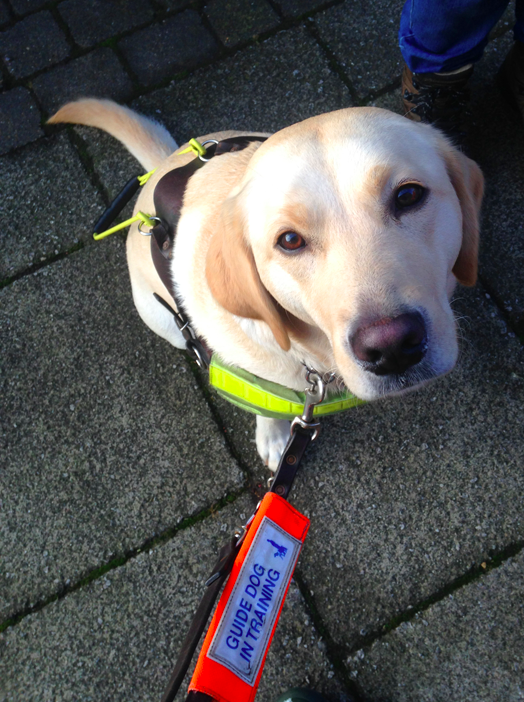 This is a major concern for me as I have just been matched to my Guide Dog and will be wanting to travel more independently via tram in the very near future. Buses are also a serious problem with many bus drivers not acknowledging their blind passengers waiting at the bus stop and continuing to drive on, with a good number of drivers not knowing how to correctly support a blind or visually impaired passenger onboard. When I travel to London, for Envision steering group meetings at Judd Street, I always grasp the opportunity of travelling aboard a talking bus when heading back to Euston. I'm constantly blown away by how easy they are to use, with each stop being announced before the destination is reached. In contrast, buses in Greater Manchester do not have these systems implemented and I never know which stop to get off at resulting in disorientation and panic. The MEPS were enthusiastic and supportive to be involved with helping eradicate transport issues in my area and hopefully we can make a difference to the barriers currently in place to visually impaired and blind passengers. My visit to Brussels was documented in a small piece featured in the November 10th edition of the Manchester Evening News. 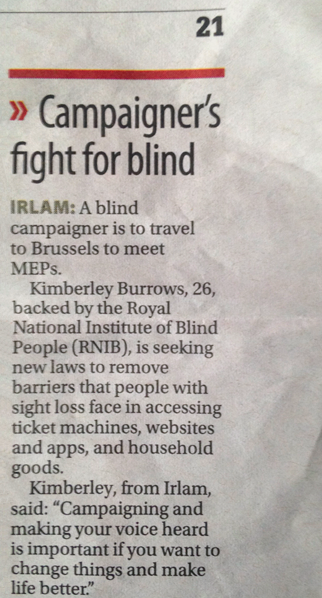 Article reads: A blind campaigner is to travel to Brussels to meet MEPS. 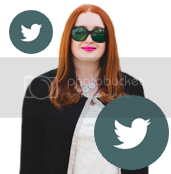 Kimberley Burrows, 26, backed by the Royal National Institute of Blind People (RNIB), is seeking new laws to remove barriers that people with sight loss face in accessing ticket machines, websites and apps, and household goods. Kimberley, from Irlam, said: "Campaigning and making your voice heard is important if you want to change things and make life better." 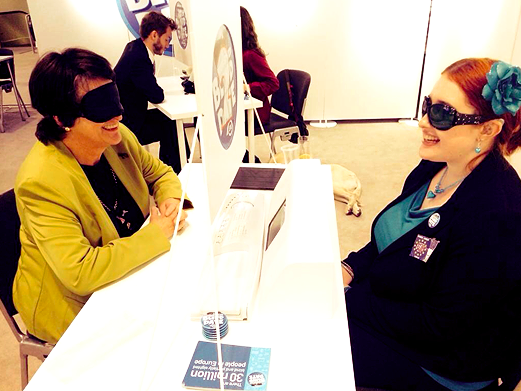 The European Blind Union published their Access Denied report online on November 11th to coincide with the Blind Date event. The report summarises the issues that the EBU are currently in the process of working on. You can read more about the two-day event that I attended here and can follow the EBU on Twitter here. I had an absolutely wonderful experience at the European Parliament and met so many supportive people who had nothing but positive things to say about my involvement with the project, and my enthusiasm for blogging and social media as a severely visually impaired person. 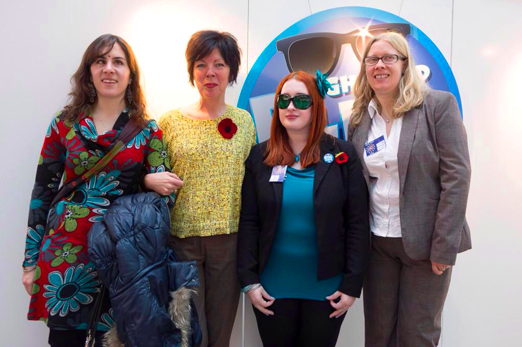 I want to say a big thank you to the RNIB and to the EBU for having me at the event! The cover of Scouts Magazine's 'Get Active' supplement has now been put together by the design team! 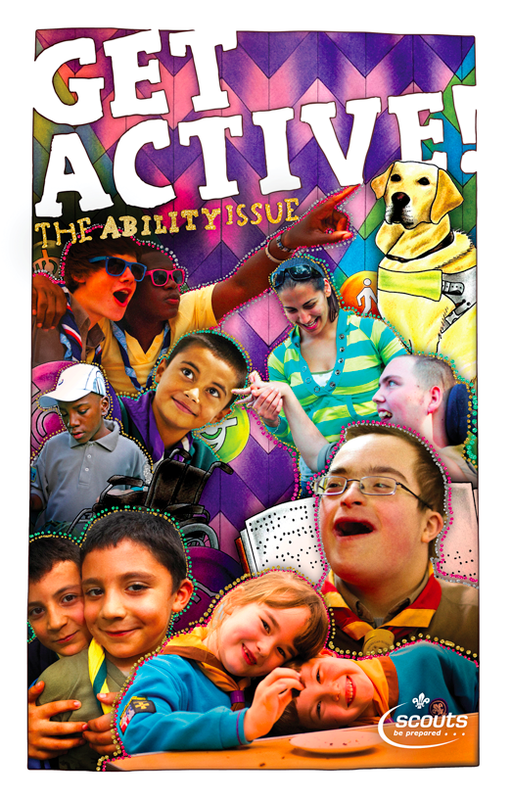 The cover features illustrations I recently created for their Ability Issue focused around accessibility and inclusion among Scouts and Cubs in the UK. Get Active! says: "This issue we're delighted to bring you a supplement dedicated to inclusion, echoing Scouting magazine's core theme. As always, we want to emphasise that scouting is a Movement that is inclusive and open to all, and here we provide you with some great ways of bringing the additional needs of others to the forefront of your programme. From learning Braille to games to suit a range of abilities, this issue is a celebration of the wonderful variety you can find within Scouting today. And we simply couldn't be prouder. Enjoy the issue!" The inside of the cover contains a section about my involvement with the project as well as a short bio and photo. Here are my original drawings that were used for the Get Active! supplement; including the background and the illustrated elements featured around the collage. 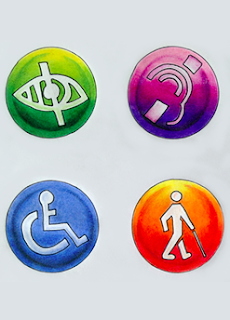 I wanted everything to be bright and colourful and to showcase as many different disabilities as possible. As always, I used my favourite mediums of black fine liner and coloured pencils and the project took most of the month of October to complete. I want to say a big thank you to the magazine's Art Editor, James Daniel, for getting in touch and for inviting me to be part of this project. It is an honour to be included in the ability issue and I'm extremely happy with the final result! 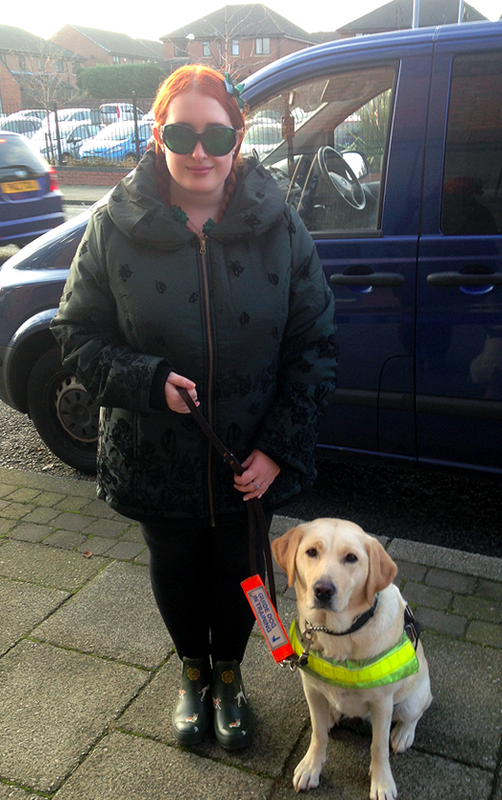 I have now finally been matched to my Guide Dog, and I would like to introduce Tami to my readers! She is a Labrador cross Golden Retriever and will be turning 2 years old in a few weeks time. 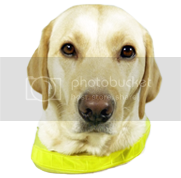 My journey has lasted 14 months from first signing up, last September at the Fun Day event at the Guide Dogs Training Centre in Atherton, Leigh to then having my initial assessment, mobility assessment and final assessment this past August. I received the call yesterday that I had a potential match, and I wanted to meet Tami as soon as possible so the meeting was scheduled for this morning. 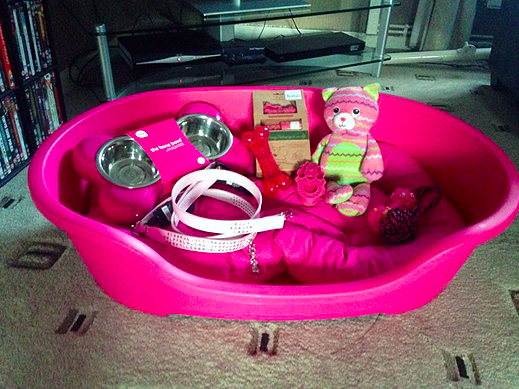 She was incredibly excited to see her basket of goodies waiting for her, including; bedding, bowls, toys and grooming tools! The first thing she did was pick up her squeaky bone and cat plushie! 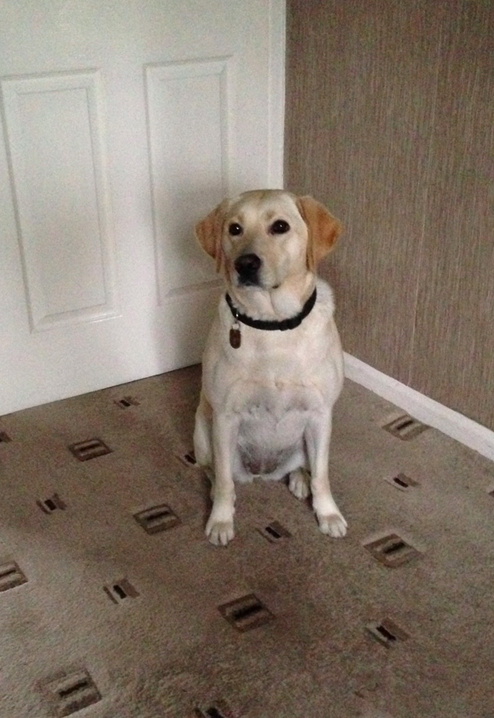 Tami has recently joined the Guide Dog Twitter community online by taking the plunge and creating an account! 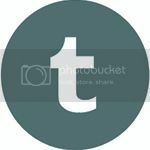 You can visit her profile by clicking here. Tami and I are a perfect match and we will be meeting again in 2 weeks time. I will officially begin my training at the Mercure Hotel in Bolton on December 1st! I have now reached the amazing milestone of 10,000 views on my blog! I want to say a very big thank you to my readership for making this possible! 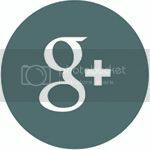 When I first set up my blog, I never dreamed I would reach such wide an audience and have so many views on each blog post within the first hours of submitting. Your support has been overwhelming and I truly appreciate it. Here is my final magazine scan of my illustration featured in the latest issue of RNIB's Insight Magazine, November / December 2014 edition, as their Young Illustrator of the Year for 2014! The overall theme of the latest issue is 'motivation and reward' and I portrayed that in my final illustration for the magazine, displaying the achievements and opportunities I have received this year since becoming the Illustrator of the Year for the RNIB. 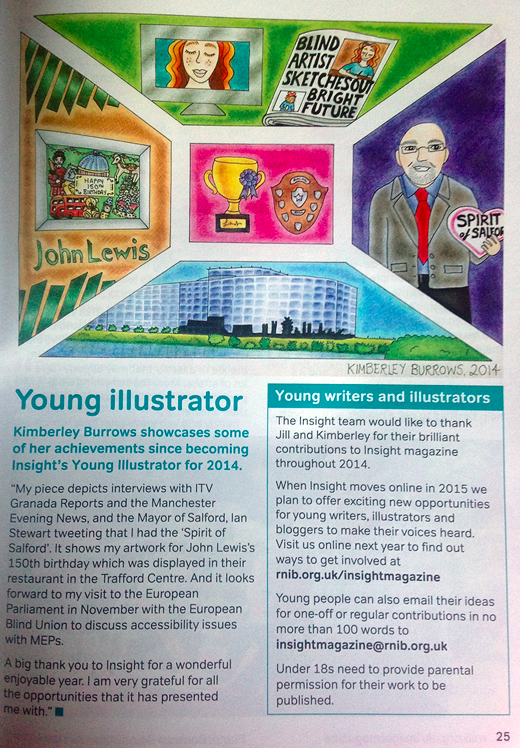 Kimberley Burrows showcases some of her achievements since becoming Insight's Young illustrator for 2014. "My piece depicts interviews with ITV Granada Reports and the Manchester Evening News, and the Mayor of Salford, Ian Stewart, tweeting that I had the 'Spirit of Salford'. It shows my artwork for John Lewis's 150th birthday which was displayed in their restaurant at the Trafford Centre. And it looks forward to my visit to the European Parliament in November, with the European Blind Union, to discuss accessibility issues with MEPS. A big thank you to Insight for a wonderful, enjoyable year. I am very grateful for all of the opportunities that it has presented me with!" 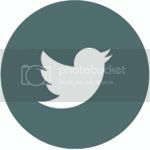 I have received some wonderful tweets from the official RNIB Twitter accounts recently, as well as tweets of support from fellow Twitter users. I wanted to share my favourites here! 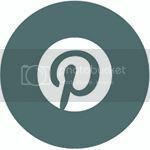 @Glittered Well we've loved sharing your work! 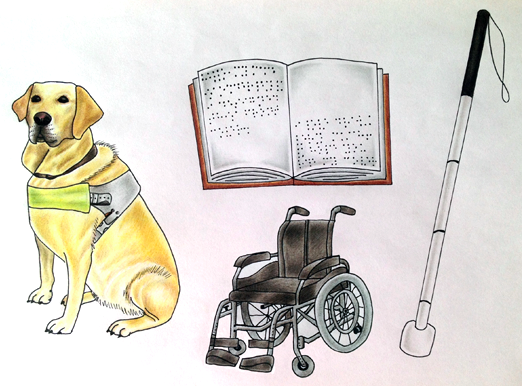 @Glittered hey Kimberley, I'm a sight impaired illustrator from New Zealand. Lovely to read the article about your work this morning! 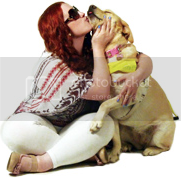 @RNIB @Glittered @MailOnline Amazing! What a talent. 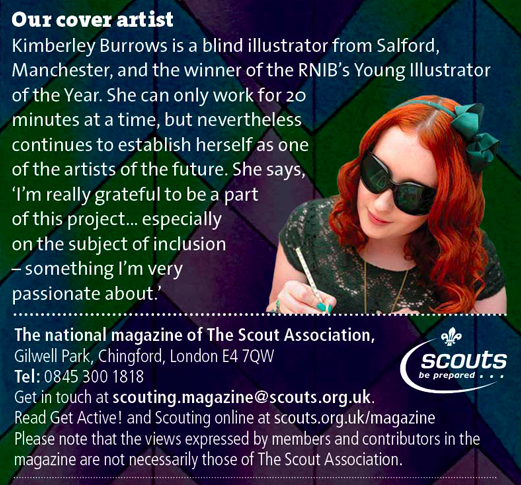 @RNIB @Glittered wow, very talented young woman! The newest edition of Insight Magazine is available now in large print, Braille, audio and PDF formats. 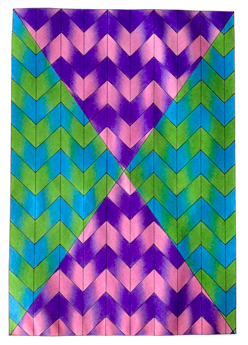 Insight magazine will move online in 2015 with new opportunities in writing, illustrating and blogging. 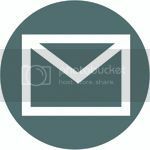 For more information on how you can subscribe please click here. I was contacted recently by Ruth Walmsley, of Manchester Blind Football Club, to help promote a new sports and social club, in the Manchester area, for visually impaired and blind people. V.I.Bees was formed by Greater Manchester visually impaired volunteers and coaches to encompass interest in all things sport and social; with the chance to meet weekly, socialise and enjoy both basic and competitive sport. It is suitable for all ages, sight conditions, and fitness levels. 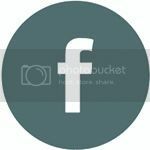 Upcoming events include a visit to Blackburn's rifle range, an annual social event on November 9th and lunch and live music in Newcastle in the near future. March 2015 will present the opportunity of weekly sound tennis to the current football offering.